Ecovacs Deebot N79 vs N79S - Which is Worth My Investment? By comparing robotic vacuum cleaners such as the Deebot N79 vs N79s, you find out that they were designed mainly to make cleaning easier and faster without the need for human intervention. Since their functioning is quite similar, it most people assume that they are 100% similar. 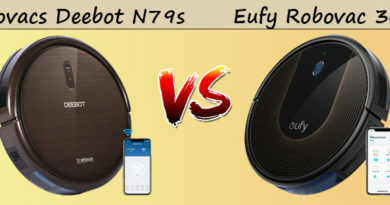 Which Robotic Vacuum Should I Invest in Between the Deebot N79S vs N79? Apparently, there are a myriad of differences in their designs, functioning, pros, cons and even operation. Among the different vacuum cleaner models, the Deebot N79 and the Deebot N79S from Ecovacs are two brands that most people find confusing. While each of them does an amazing job at cleaning your floors, knowing their major differences as will be discussed later, will be handy for choosing the right kind for your specific vacuuming needs. For some time now, the Deebot N79 has been reigning among the most affordable vacuum cleaner brands in the market. Due to its high reception in the market, Ecovacs has now released its upgraded version, the Deebot N79S with more advanced features and probably more effectiveness. Reviewed below are these two popular robotic vacuums. The Deebot N79 has been the highlight of the Ecovacs brand as it stands strong among the most popular robotic vacuum brands such as Roomba and Neato. This can be attribute to its greatly affordable price, which is really amazing given the incredible features it possesses. Superb suction power, longer run time, multi-surface compatibility, great convenience and most importantly an impeccable clean, are just but a few of the benefits you stand to achieve from the Deebot N79. With its intelligent app control, multi-cleaning modes, smart motion sensors, V-shaped main brush and reliable filtration system, there is absolutely no reason not to invest in this robotic vacuum. 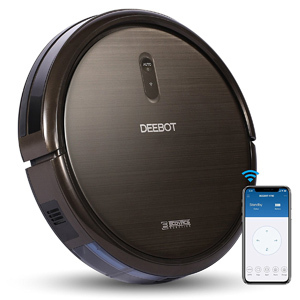 The Deebot N79 features Smart App Controls that allow you to schedule and track vacuuming sessions, battery life and accessory status via a 2.4 Hz Wi-Fi network. You can also receive error alerts and warning signals via the smartphone or tablet app that is compatible with both Android and Apple devices. This vacuum’s 3-tier cleaning system consists of the direct suction vacuum, a helix brushroll and dual side brushes that are intended to give your floors a thorough clean. In addition to this, it features 4 cleaning modes namely, Auto, Edge, Single room and Spot cleaning modes for different cleaning needs. The ability to scan its surroundings and detect obstacles, edges and clear space is what the Smart Motion Navigation feature is all about. Its anti-collision and drop sensors are what prevent the Deebot N79 from falling off stairs and other edges, or bumping onto furniture, walls and other obstacles during vacuuming. This level of intelligence is particularly what quells this vacuum cleaner’s need for human intervention during vacuuming. While most robotic vacuums will offer you only 30 minutes of cleaning time, the Deebot N79 beats the odds by handing you 100 minutes of battery life. Its rechargeable Lithium ion battery is also responsible for consistent and 64 dB quiet cleaning. On the minimal human intervention focus again, this robotic vac does not need your help when it comes to recharging. Once a low battery level is detected, the Deebot N79 automatically moves to its charging dock and is recharged. This helps to minimize the breaks in between cleaning sessions even if you are not at home. The Deebot N79 features one of the best high efficiency filtration systems in the world. With its HEPA filters, this robotic vacuum is suitable for getting rid of the tiniest dirt particles and allergens that may spark asthmatic attacks and other allergic reactions. It is therefore a great investment for households with pets and people with dust, pollen and dander allergies. 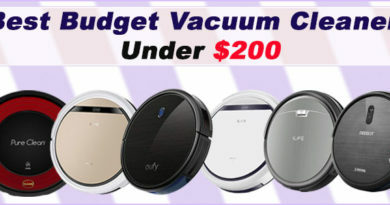 Its low-profile design makes it possible for the vacuum to get into tight surfaces such as under your sofas or the bed. The cylindrical design reduces impact in case the vacuum bumps onto an obstacle, as it will simple roll onto the obstacle rather that hit it with force, which may destroy it. As much as this robotic vacuum offers remote control capabilities, it is not Alexa compatible thus cannot be controlled via voice controls. This robotic vacuum cleaner does not have virtual boundaries or the E-map. This means that its cleaning radius is controlled by physical boundaries such as walls only. As mentioned above, the Deebot N79S is an improved version of the Deebot N79 model. It comes equipped with better technologies and additional features including Amazon Alexa, Amazon Echo and Google Home compatibility, which enables voice control capability among other contemporary control options. With its Smart Home compatibility, you can easily control your Deebot N9S from anywhere and at any time via the Ecovacs App. The convenience offered by this robotic vacuum in terms of easier scheduling and remote operation is unmatched by most robotic vacuums of its caliber. It also runs on a Lithium ion battery that offers a 100-minute runtime. Its high efficiency filtration system is among the best in the market and is recommended for people with allergies to dust, pollen and other household dirt. 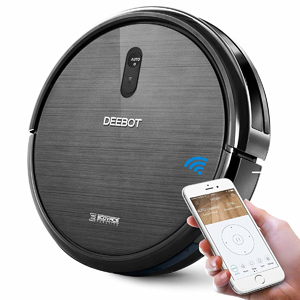 With all these incredible features, the Deebot N79S is truly a genius in the vacuum cleaning niche. The Deebot N79S is an intelligent robot on its own. It can be controlled from anywhere via a 2.4 GHz Wi-Fi network using the Ecovacs Smartphone App. This app allows scheduling, tracking and adjustment of cleaning sessions, battery life, accessory status and other important settings. With this app, you can get your vacuum to clean from across the room, or at your office. You don’t even need to be near it for it to work. The N79S’ motion is among the most intelligent in the world. Using its Smart Navigation Technology, which incorporates the anti-collision and anti-drop sensors, you will hardly get your vacuum bumping into obstacles or falling off edges. Not only does this prevent breakage, but it also keeps the home safe in the long run. This navigation system also ensures that for every area cleaned, there will be multiple vacuum passes to ensure that it does not leave any dirt on the floor. For a spotless clean, this vacuum incorporates 3 stages in each of its sweeps. There is the direct suction, which is obviously reliable, then the helix brushroll that agitates and lifts any dirt from the floor, and then the dual side brushes that are responsible for cleaning edges, corners and other tight spots. This is surely the most effective vacuuming that similar models have ever achieved. The N79S offers you a whole 100-minute runtime, which is enough to vacuum an entire modest home. Its recharge time is approximately 3 to 4 hours. Even better is the fact that whenever a low battery is detected, this vacuum cleaner will automatically roll to its charging deck for recharge, after which it will seamlessly resume its duties. By reducing interruptions due to low battery, this vacuum will leave no spot on your floor dirty. The Deebot N79S features 5 cleaning modes namely the Auto, Spot, Edge, Single room and Max modes. The Auto mode involves simply pressing the auto button and the vacuum starts cleaning any free floor space automatically. The Spot cleaning mode is meant for the dirtiest spots while the Edge mode vacuums edges, corners and tight spaces. Finally, the Single room mode prevents the vacuum from getting out of the room when vacuuming, while the Max mode increases its suction by 50% and is meant for the toughest dirt and stains. This robotic vacuum is compatible with other devices that are compatible with Google Home, Amazon Alexa and Amazon Echo. This means that the vacuum can be controlled alongside other devices in the home, which makes cleaning even more convenient. All that is needed is a reliable Wi-Fi connection and the home automation system of your choice and you’ll be good to go. Whenever this vacuum cleaner detects a low battery, it automatically rolls to its charging dock, recharges and gets back to work. Its recharge time is between 3 to 4 hours. This reduces instances of interruption due to low power like other vacuum cleaner models that will end their cleaning when they run out of power until you manually recharge them. Its reduced need for human involvement is what makes it so reliable and convenient. With a combination of a filter net, sponge filter and high efficiency filter, the Deebot N79S works with precise capture of dirt in mind. This HEPA filtration system is designed to capture even the tiniest dirt particles and allergens, which in turn protect your household from asthma attacks and other allergic reactions. For maximum stability, the Deebot N79S features a low-profile cylindrical design with a wider radius. This also ensures that it easily penetrates under low furniture and other tight spaces during vacuuming. This robotic vacuum does not support virtual boundaries or E-map technology. This means that only physical obstacles like walls can control its vacuuming area. Compatible to Google and Amazon home automation systems. Its app is compatible to Android and Apple mobile devices. Does not support setting up of virtual boundaries. From a simple outlook, the Deebot N79 and the Deebot N79S are similar in design. They both feature a circular design that reduces impact in case of bumping onto obstacles by simply rolling on it. They also have a similar low-profile design that makes it easier for these robotic vacuums to clean effectively under beds, couches and other low furniture. However, a closer look at them reveals some design differences such as size and weight. For instance, the N79S is a little bigger and weightier than the N79; a property that gives it added stability. In terms of design, the Deebot N9S is the best choice as it is wider thus more stable, but this doesn’t mean that the N79 is not strong and stable. As mentioned above, the Deebot N79S is a little bigger and heavier than the Deebot N79. The N79S stands at 13.9 inches by 3.27 inches in dimensions while the Deebot N79 measures 12.99 inches by 3.07 inches. When it comes to weight, the former weighs 9.48 pounds while the latter weighs 6.17 pounds. This translates to more stability for the N79S as compared to the N79. This thus makes the Ecovacs Deebot N79S the obvious choice for any homeowner who doesn’t want interruptions that may be caused by the vacuum toppling over especially when transitioning from one floor type to another. Both the N79 and the N79S models boast of some incredible suction power of approximately 1000 Pa, which makes inhalation of any dirt particles more effective. However, the N79S model features the max mode, which increases suction power by 50% and is handy whenever you encounter the most stubborn dirt and stains, while the N79 model doesn’t feature this mode. Both of these vacuum cleaners make use of a 3-stage cleaning process that involves lifting of dirt, sweeping and vacuuming, all within a single sweep, thanks their great suction and V-shaped brush. They also come with 4 different cleaning modes including Auto, Single room, Edge and Spot cleaning modes so you can achieve a thorough clean regardless of your vacuum cleaning needs. Their precise independent navigation is made possible by the Ecovacs’ Smart Motion Technology, which makes it possible for the vacuum cleaner to scan the surrounding spaces and detect obstacles, edges and free spaces. This technology also detects dirt and makes the vacuum to move back and forth in the dirtiest spaces, thus giving your floors a thorough clean. Both of these robotic vacuums have the best advanced technologies that perform amazing floor cleaning chores. However, for the toughest dirt especially on carpets, then the Deebot N79S is the winning brand mainly because of its Max mode. Most robotic vacuums are usually designed for hardwood, tiled and bare floors, but with these vacuums’ 4 cleaning modes, you can also clean low-pile carpets with them. Their Smart Motion technology ensures that the vacuum goes back and forth on any spot for a flawless clean. The Deebot N79S’ Max Mode is particularly important if your floors are susceptible to stubborn dirt and stains, particularly for carpeted floors. Unfortunately, for thick rugs, shags and carpets, these two robotic vacuums may not be the best choice. They may also not work perfectly in getting rid of long pet hairs. Given their versatility in vacuuming different floor types, based on this criterion, it is a tie between these vacuum cleaners. However, based on the cleaning quality, the Deebot N79S wins. Robotic vacuum cleaners are intended to reduce or end the need for human intervention. For this reason, these two models are designed in such a way that they are easy to use. To use these two, you can simply press the Auto button for manual starting of the Auto cleaning mode. The other better option is to use the Ecovacs app to control the machine over a Wi-Fi network. In addition to changing modes and adjusting settings, you can also schedule cleaning for when you are away and even monitor the cleaning right at your palm. To eliminate the need for human intervention during vacuuming, whenever a low battery is detected, these vacuums have the ability to move to their charging dock automatically for a recharge. They can then resume their vacuuming. Using these robotic vacuums is equally simple as the technologies incorporated in them are pretty much the same. In this case, both of these vacuums win. 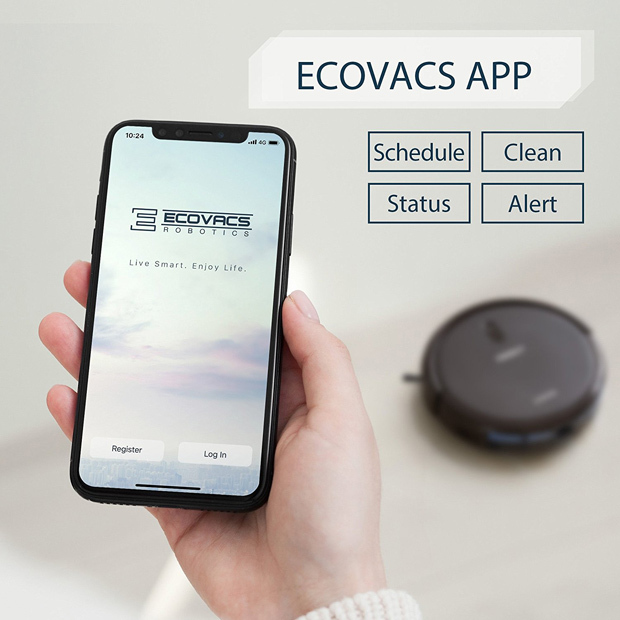 The Ecovacs Deebot N79 and N79S models can be controlled remotely via a Wi-Fi connection, from the Ecovacs mobile app. With this app, you don’t need to be at home for your vacuum cleaner to perform its chores. You could even schedule it to vacuum your floors as you please. You can even control and monitor its motion, modes, settings and schedule at the simple touch of the button. This app is compatible with both Apple and Android devices. The difference between these two robotic vacuum cleaners is that the N79S model supports Amazon Alexa, Google Home and Amazon Echo, thus can be connected with other compatible devices and even controlled using voice controls. The N79 lacks these features, therefore making the former the sinned under this category. Just like any other vacuum cleaner, the Deebot N79S and the Deebot N79 also need regular maintenance. Emptying and cleaning the dustbin is the first essential maintenance procedure. You also have to replace the HEPA filters as recommended in the manufacturer’s manual. In terms of dustbin capacity, these two are at approximately 300 ml. For both models, there will be a red light and three beeps to indicate that the dustbin is filled up and needs emptying. Alongside the red light, one beep indicates that the vacuum cleaner is stuck, two beeps indicates dust buildup in the bumper while four beeps indicate a brushroll malfunction. A blue light signifies a low battery. Both of these vacuum models have similar indicators and require quite similar maintenance procedures. This means that both of them win under this category. For a very long time, the Deebot N79 has been among the highest rated lowest priced robotic vacuum cleaner models. It costs only $224.58 on Amazon. The Deebot N79S that is more advanced, costs only $249.98, which is very affordable. Both of these models are very cheap considering the great benefits you stand to achieve by investing in any of them. From the above comparison between these two Ecovacs robotic vacuum cleaners, the obvious winner is the N79S. It comes with more advanced features than the N79 and is relatively cheap. It is actually the best budget model, but this does not dampen the greatness of the N79. 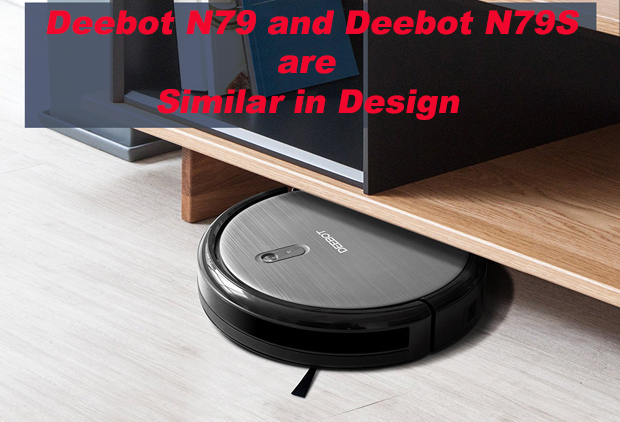 Actually, the Deebot N79 is the basic building block for the N79S and features some of the best robotic vacuum cleaner technologies in the market. The effectiveness, convenience, great performance and unbelievable affordability are the qualities that sell these two vacuums. They are definitely worth your time, effort and money.